Cooking and food preparation can become a bit of a drudgery at times, we sometimes fall into a rut of making the same things over and over cooking it the same way. It can be hard to break out of that cycle. One way to inject some excitement into your cooking and eating is to try new foods. Another way is to try new cooking methods. I grew up in a Colombia and the long, slow cooking of meat over fire was a part of almost every celebration. I grew to love the taste and always equated it with happiness and celebration. Here at Chiot’s Run you’ll find me cooking over the fire on occasion, not as much as I’d like to but often if I have time and it’s a beautiful day. It is the one way I like to spend some down time. There’s nothing more relaxing than sitting around a fire and it’s even better when the smell of good food is mingled with the smoke! There’s no need for expensive grills or special equipment. My grilling rig consists of a few cinderblocks and an old grill grate, they cost me nothing. This past week I roasted a whole chicken over the fire out back. 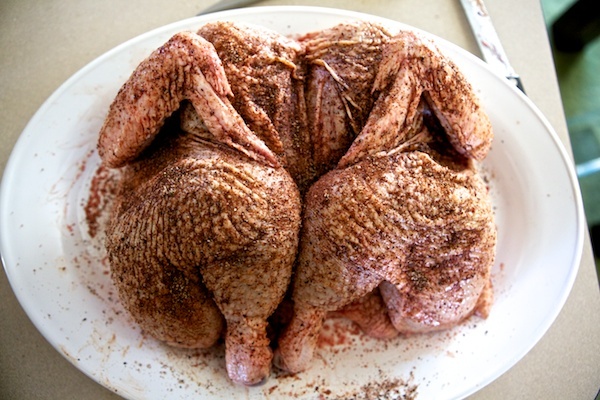 It was a whole chicken from Martha’s Farm that I rubbed with a good measure of freshly ground pepper, sea salt, and chiptole powder. 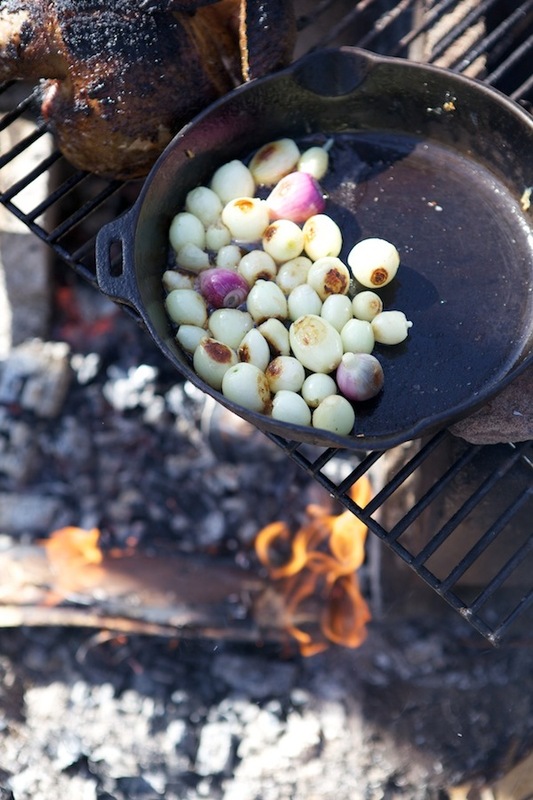 I put in over the hot coals for about an hour and half and we enjoyed it with a garden fresh salad, and potatoes & onions cooked in a cast iron skillet over the fire. 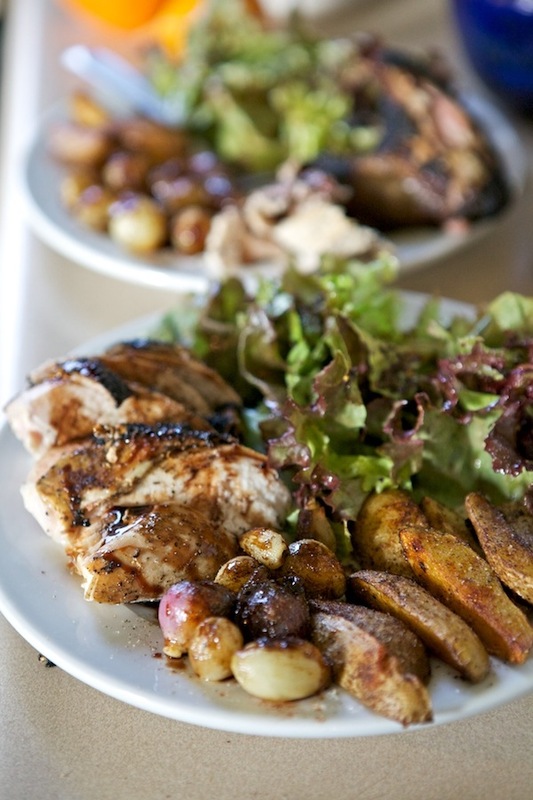 Everything was drizzled with a bit of good balsamic vinegar and we were feasting like kings! In past I’ve roasted fish, venison, beef and lots of various fruits and vegetables. It’s wonderful to inject a little smoky goodness into your diet and get out of that cooking rut! What’s your favorite fruit, vegetable, or meat to eat grilled? In the summer, we grill a lot! Our favorites are ribeye steaks with grilled asparagus & grilled zucchini slices. We’ll toss both veggies with homemade Italian salad dressing or a drizzle of olive oil & herbs & grill just a few minutes on either side.. I also love to make grilled sausage stuffed peppers on the grill. Definitely one of my favorites..
I’ll grill anything. We use our grill more than our oven. We live in a townhouse, so we can’t have an open fire pit where we can grill like you do (which is unfortunate). We did break the rules once and use one of those portable fire pits and my husband threw a grate over it so we could slow roast an entire (small) deer. That was an amazing feast. A whole deer sounds amazing over the fire. I’d love to do that someday!